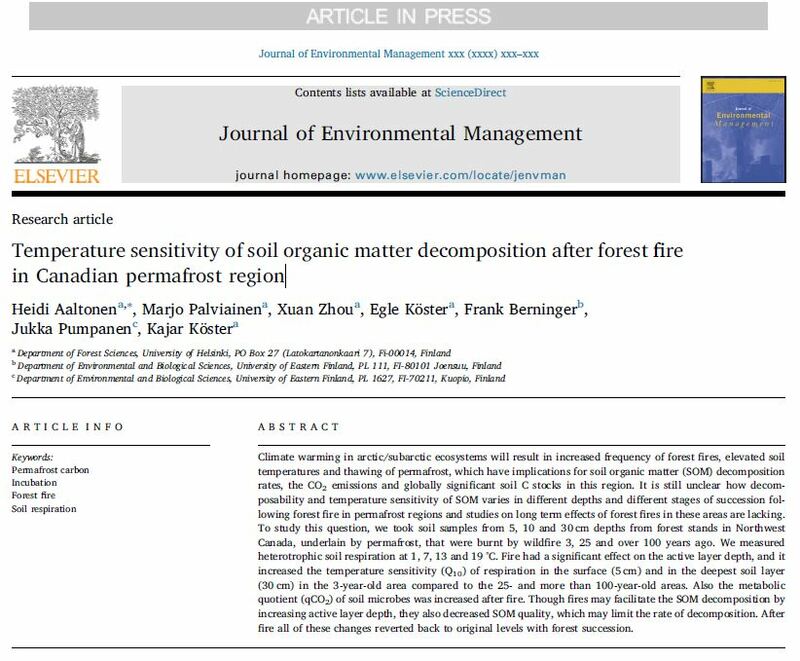 Temperature sensitivity of soil organic matter decomposition after forest fire in Canadian permafrost region. New paper by Aaltonen et al., 2019 determines how heterotrophic soil respiration (Rh), originating from the decomposition of SOM, and the Q10 of this process vary between different depths over the years following a forest fire in permafrost-affected soils. How the microbial biomass and qCO2 are affected by the fire, and what are the most important factors affecting the Q10 of SOM decomposition. The results indicate that forest fires may facilitate the decomposition of permafrost SOM by increasing the active layer depth, but on the same time fire increased the temperature sensitivity of decomposition. The SOM in the permafrost surface was less temperature sensitive than the SOM in the soil surface. The post-fire decreases in ground vegetation were reflected in the SOM temperature sensitivity shortly after fire but seemed to return to original levels with forest succession. The fire also increased the microbial qCO2, and these changes partly explain the lack of significant decrease in heterotrophic soil respiration after fire, as the microbes may use more C for respiration in the recently burned areas compared with the older areas. Even though fires increased the active layer depth, the decrease in SOM quality caused by fire may limit the decomposition rate to some degree. 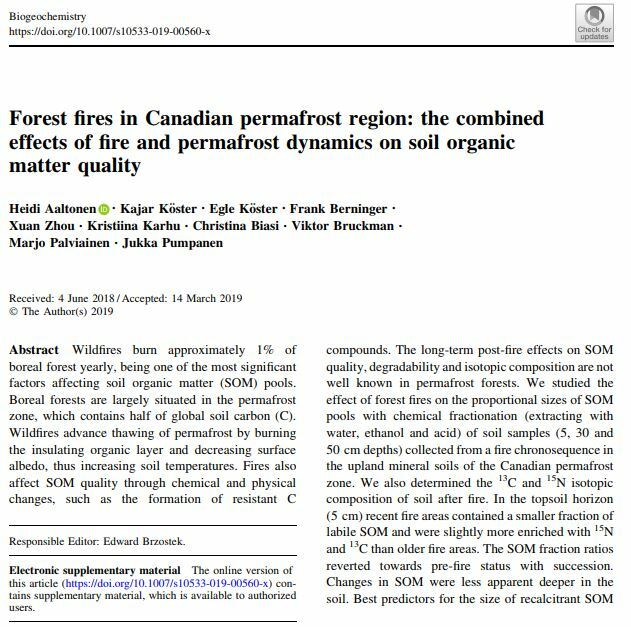 New paper by Aaltonen et al., 2019 studied how the proportions of insoluble (recalcitrant) and soluble (labile) fractions in soil organic matter (SOM) change as a result of forest fire in the active layer on permafrost, and what are the most important factors (active layer depth, soil temperature, biomass, C/N ratio) explaining the size of insoluble (recalcitrant) fractions of SOM post-fire. Also the abundancies of stable isotopes δ 15N and δ 13C change along with depth and time since last fire was studied. The SOM fraction ratios reverted towards pre-fire status with succession. Changes in SOM were less apparent deeper in the soil. Best predictors for the size of recalcitrant SOM fraction were active layer depth, vegetation biomass and soil C/N ratio, whereas microbial biomass was best predicted by the size of the recalcitrant SOM fraction. 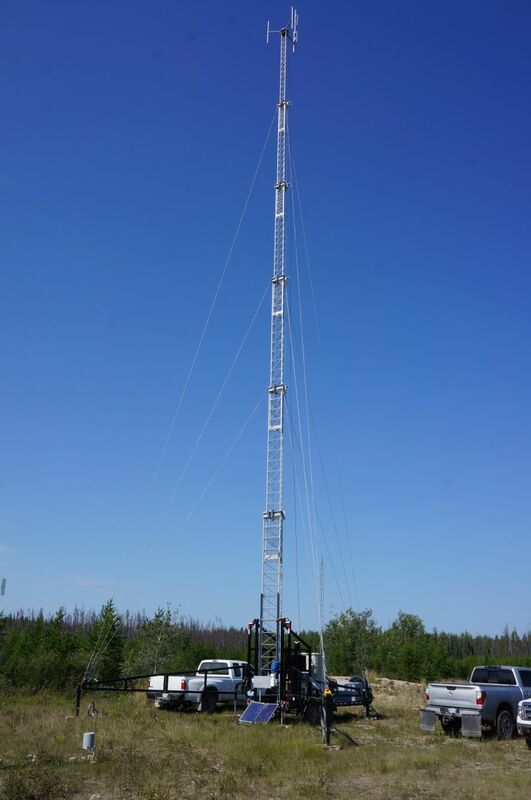 Results indicated that SOM in upland mineral soils at the permafrost surface could be mainly recalcitrant and its decomposition not particularly sensitive to changes resulting from fire. New paper by Peng et al 2019 dealing with effects of biochar addition on the fluxes and C turnover in boreal forests soils. The results of the study indicate that wood-derived biochar produced at high pyrolysis temperatures had no significant effects on soil heterotrophic respiration obtained from lab incubations in boreal Scots pine forests at 5 to 10 Mg ha–1 application rates. 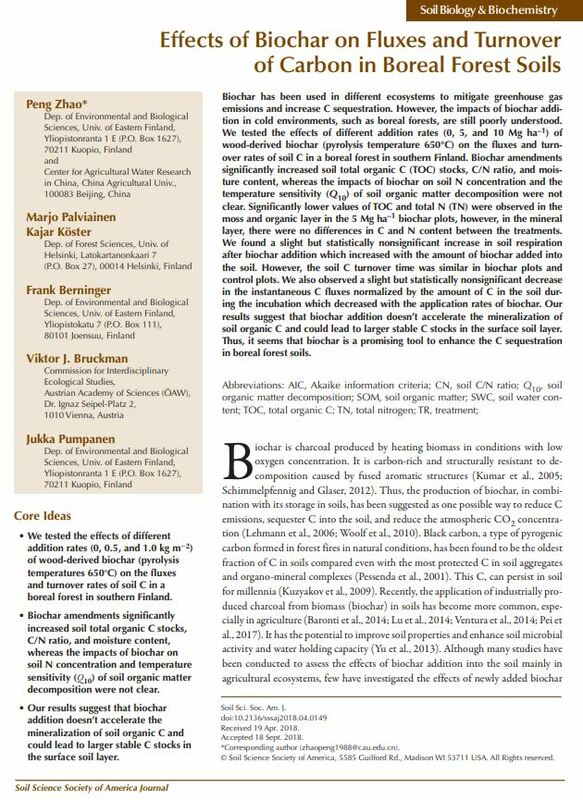 Biochar addition increased soil total organic C, C/N ratio, and moisture content, but had no clear effect on soil total N, nor on the temperature sensitivity of soil respiration. The turnover time of soil C was unaffected by biochar addition. These results indicate that from a C sequestration point of view, biochar addition did not accelerate the mineralization of soil organic C, and could lead to higher stable C stocks in the surface soil layer. 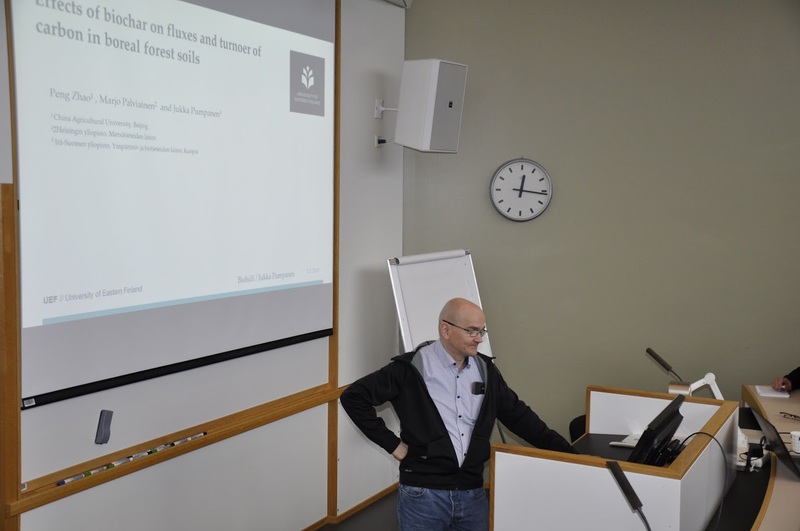 On 11th December 2018, already fourth Finnish Biochar Seminar was held in Viikki, Helsinki. ARCTICFIRE session in workshop “Disturbance legacy and forest soil carbon”. 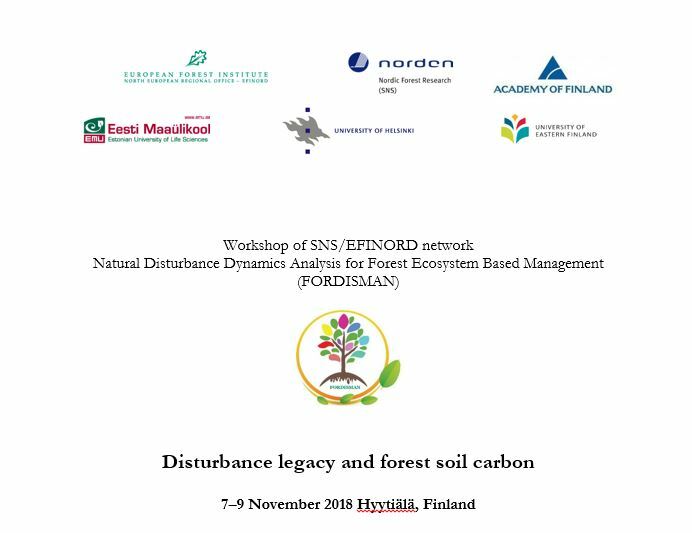 Team of Disturbances and Biogeochemistry (University of Helsinki) and SNS/EFINORD network Natural Disturbance Dynamics Analysis for Forest Ecosystem Based Management (FORDISMAN) were organizing joint workshop: “Disturbance legacy and forest soil carbon” in Hyytiälä (7-9 November 2018). Thursday (08. 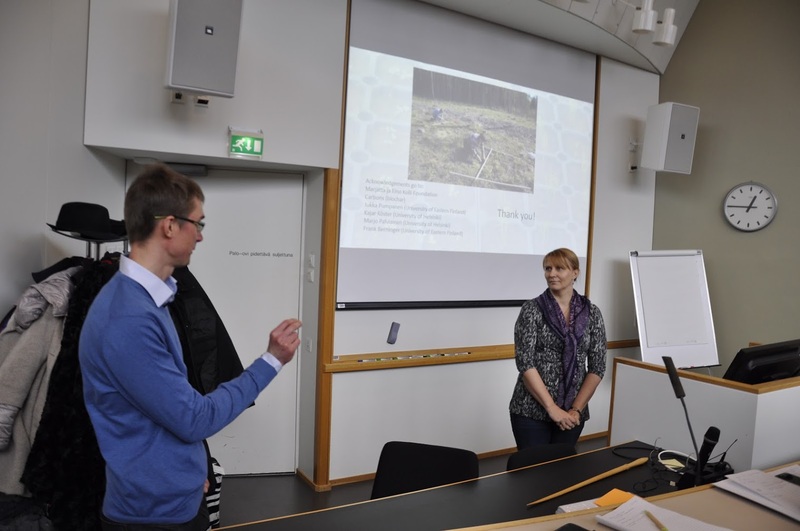 November) was a day full of presentations from scientists from Finland (University of Helsinki, University of Eastern Finland), Estonia (Estonian University of Life Sciences) and Latvia (Latvian State Forest Research Institute “Silava”). ARCTICFIRE had a special session on that workshop with seven presentations covering most of the research done under that project. Friday (09. 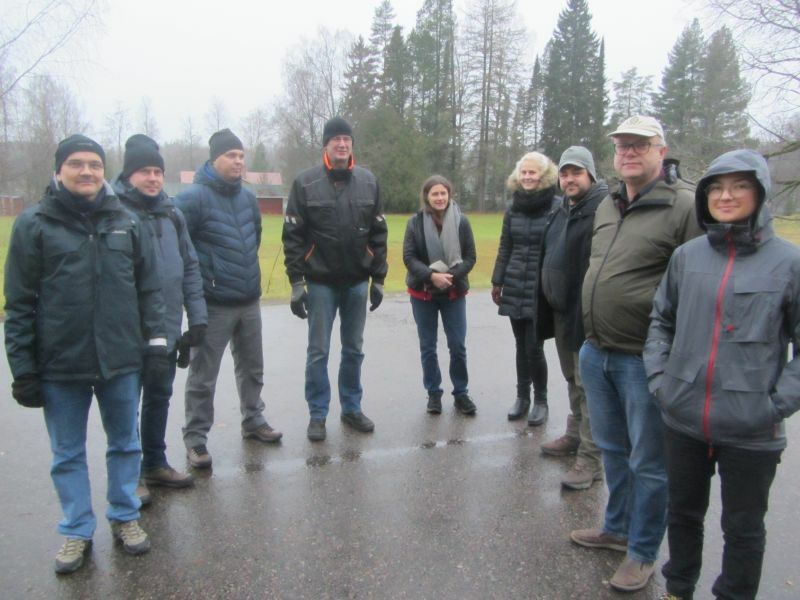 November) was excursion day, where the participants were visiting SMEAR II station in Hyytiälä. 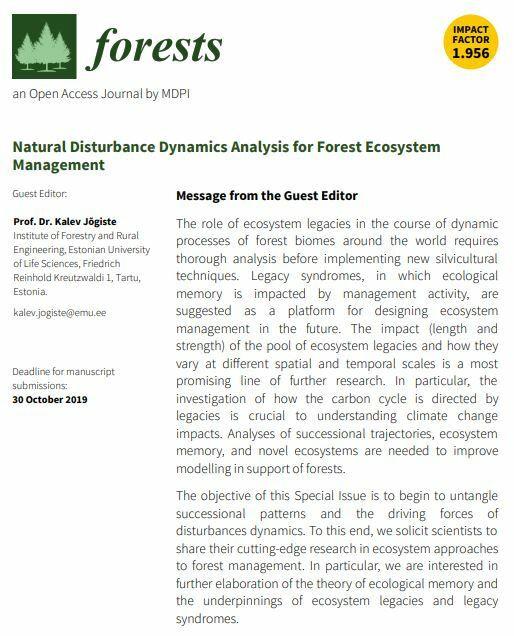 Currently there is also Special Issue “Natural Disturbance Dynamics Analysis for Forest Ecosystem Management” (with abstract submission deadline in 30 October 2019) under development in Journal Forests. 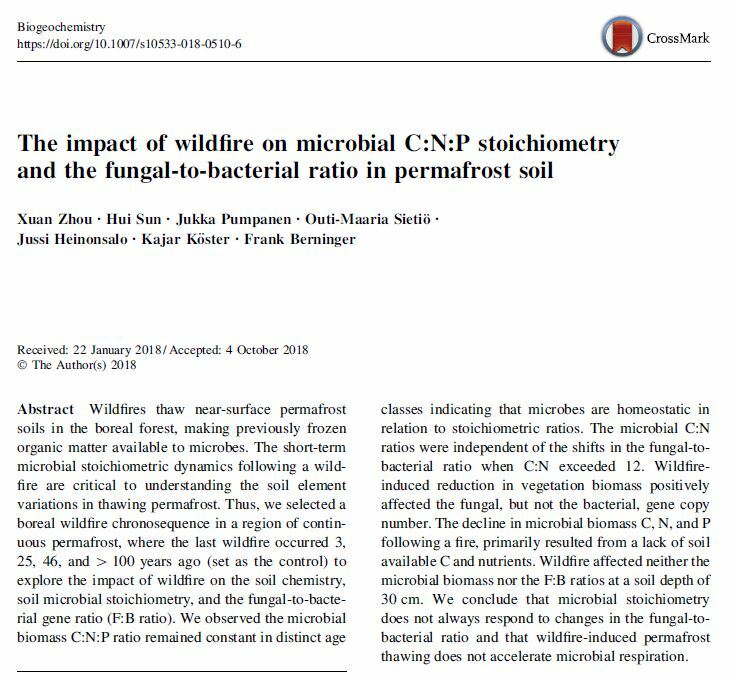 New paper by Zhou et al 2018 dealing with the impact of wildfire on microbial C:N:P stoichiometry and the fungal-to-bacterial ratio in permafrost soils. The results of the study indicate that forest wildfire increased the active layer depth and subsequently decreased soil moisture and vegetation coverage. This consequently led to a decrease in the microbial C and N contents as well as the F:B ratios. However, the C:N:P ratios in the microbial biomass remained relatively constant over time following a wildfire, indicating homeostatic regulation. Wildfire also failed to affect the microbial communities in the deep soil layers. These results indicate a complex interaction between the decomposer community, resource availability, and successional stage. Forest wildfire either shifted the microbial diversity or suppressed the microbial growth rate for several decades. 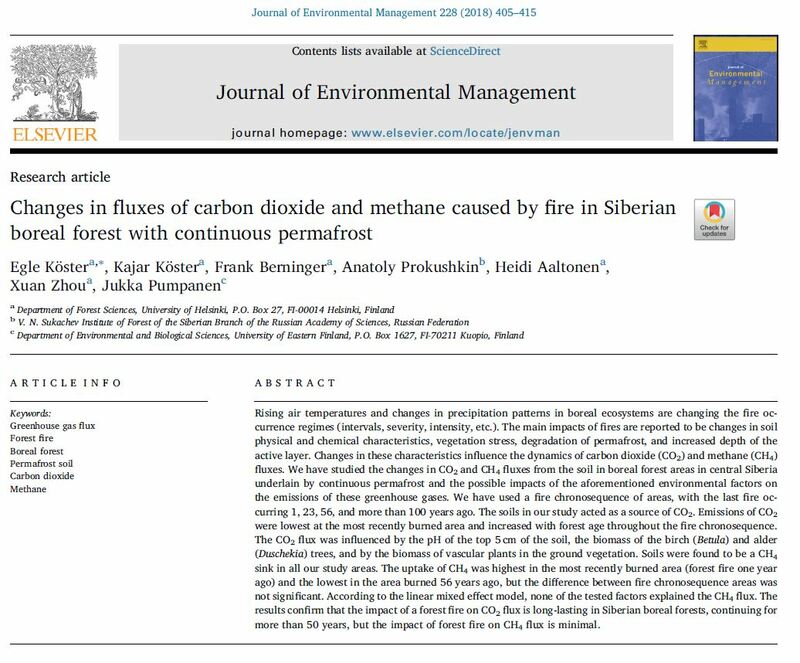 New paper by Köster et al., 2018 is dealing with the long-term effects of fires on the fluxes of two main C-based GHGs (CO2 and CH4) in boreal coniferous forest areas in central Siberia with underlying permafrost. The results of the study indicate that fire significantly affected the fluxes of CO2, and the impact of fire lasted much longer than expected based on previous studies. There was a significant decrease in soil CO2 efflux shortly after the fire, but over time the emissions started to increase and this increase continued for more than 50 years after the fire. The effect of fire on the CH4 flux was not significant in Siberian boreal forest with a permafrost base, but all the studied areas acted as a CH4 sink. There was a clear negative correlation between CO2 emissions and depth of the active layer, while CH4 fluxes were not influenced by it. 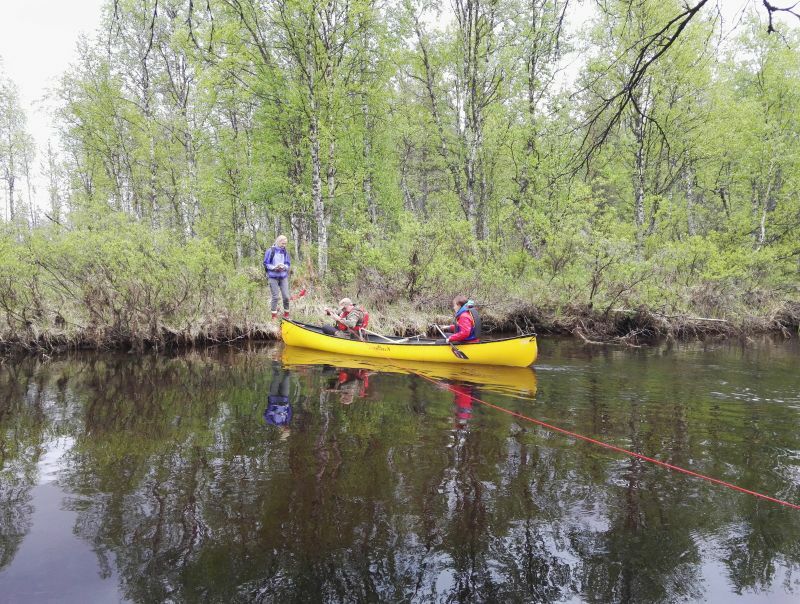 The results also confirmed that the role of recovering vegetation in CO2 emissions is significant as the main factors driving the CO2 flux were the biomass of birch and alder trees, and the biomass of the vascular plants in the ground vegetation. sites in northern boreal coniferous forest soils. 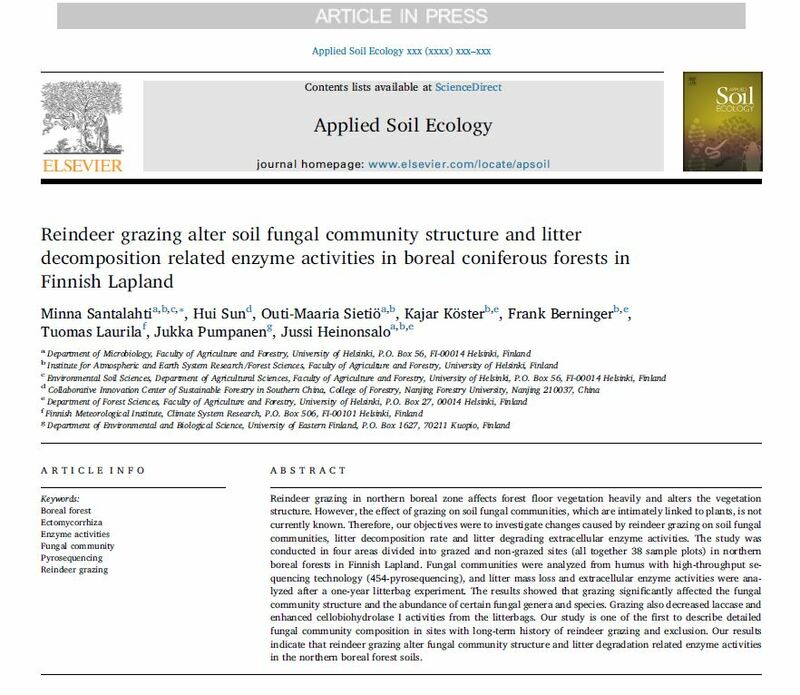 The results of the study indicate that reindeer grazing alters significantly the soil fungal community structures and the abundance of Ascomycota, as well as certain fungal genera and species. Within longer time scales, grazing may affect litter decomposition through changes in fungal community structure and enzyme activities in the northern boreal forest soils. Canada 2018 expedition is over! This year’s Canada campaign (25.07. – 15.08.2018) was divided into two. 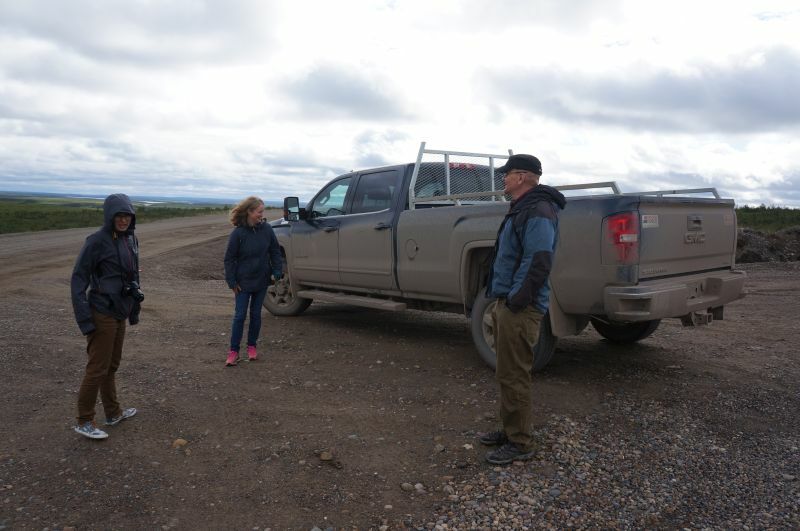 Part of the team was working on permafrost areas along the Dempster Higway (NWT and Yukon, Canada), the other part of the team was working on non-permafrost areas, on FireSmart project sites (NWT, Canada). 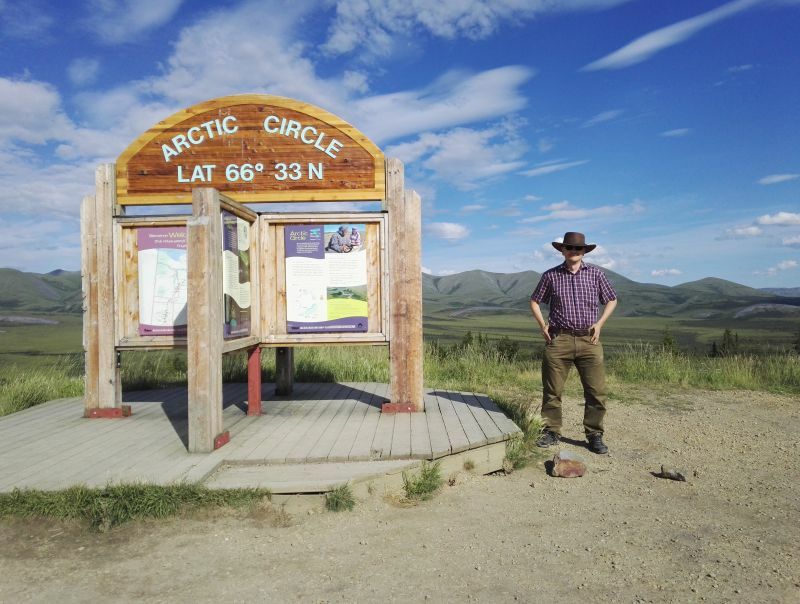 On Dempster Highway (works done by Prof. J. Pumpanen and PhD student H. Aaltonen) the sample plots that were established in summer of 2015 were re-visited. 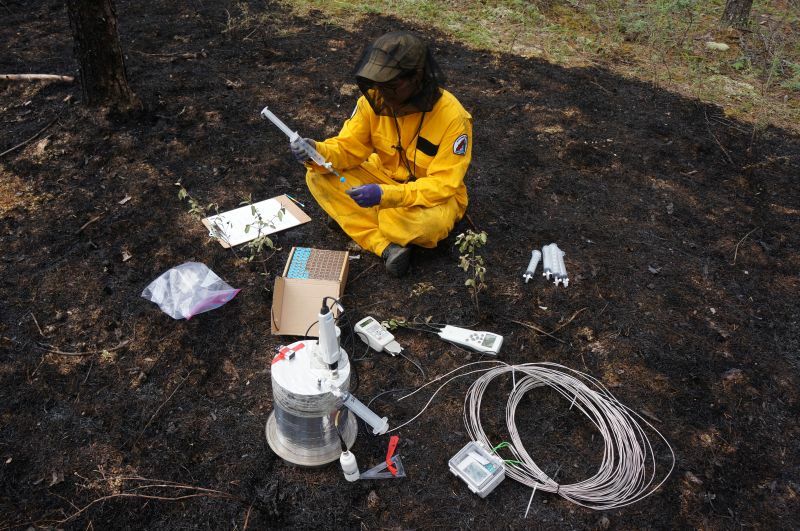 This year’s focus was on VOC measurements along fire chronocequence (fires in years 2012, 1990, and fire about 100 years ago). The short term effects of fires and the effect of different fire severity on SOM turnover was studied on experimental burning areas (the Canadian Boreal Community FireSmart Project sites and old International Crown Fire Modeling Experiment (ICFME) sites close to Fort Providence, NWT, Canada (works done by PhD K. Köster and PhD student C. Ribeiro). The research was conducted based on intensive field sampling to study soil C and N stocks, soil CO2, CH4 and N2O fluxes, soil temperature and soil chemical and microbiological properties, tree and vegetation composition and biomass changes. Unfortunately this year there was no possibility to perform high intensity crown fire, but we managed to measure in many low intensity surface fire plots. The measurements were conducted before the fire experiment, straight after fire experiment, and couple of days after fire experiment. We also measured on old fire experiment areas, where the fires took place 1, 2, 3, 4, 6 and 18 years ago. 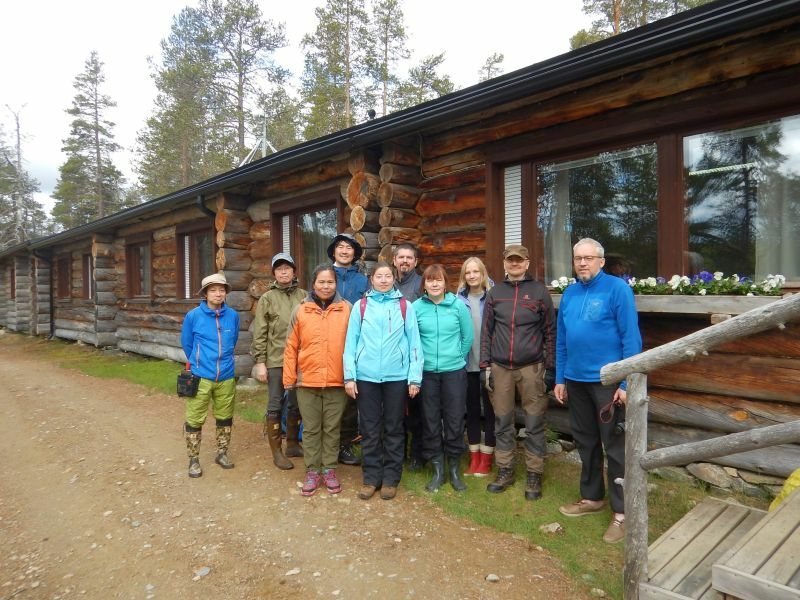 In June 2018, Jukka Pumpanen and Frank Berninger had a joint field trip to Värriö sub-arctic research station in Värriö, Finland for studying the water quality and greenhouse gas emissions in rivers and forests with researchers from the University of Helsinki (Finland), Austrian Academy of Sciences / International Institute for Applied System Analysis (Austria), Fukuoka University (Japan), Shinshu University (Japan), University of Hyogo (Japan) and the Institute of Mountain Hazards and Environment (Chinese Academy of Sciences Chengdu).